Mourinho - who has so often looked so unhappy this season - ran on to the field to celebrate with his players and was thrown in the air by his coaching staff and hugged by his son. 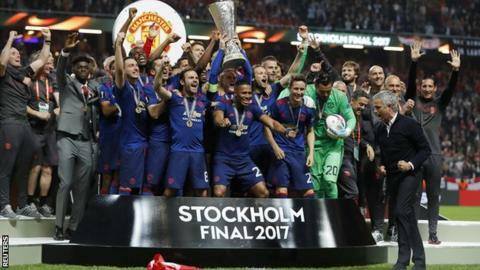 And the result means United can, finally, regard their season as a successful one as a night which started with a mixture of silence then applause for those who died in Monday's attack and ended with Wayne Rooney lifting the Europa League trophy on what is very likely to be his final appearance for the club. Ajax coach Peter Bosz said it would be understandable for his young side to feel nervous - and his fears were confirmed as they were never able to show off the full extent of their glittering promise. Six of the starting line-up were 21 or under in the youngest 11 to start a major European final, with an average age of 22 years and 280 days. In defender Matthijs de Ligt, they had the youngest player to feature in one at 17 years and 285 days. "It was a boring game. There were no chances from both sides," Bosz said after the final whistle. "I'm disappointed because you play finals to win them. We didn't. I haven't seen the Ajax that I'm used to." This was a night of disappointment for this great, historic old club but they are staying true to their finest traditions by producing outstanding young talent and showing a commitment to attacking football. Ajax have established the foundations for more success. "For all the players, this is the first final," he added. "They will learn a lot from it and we will become stronger, and if we can keep this squad together we will be stronger next season, for sure." Paul Pogba scored in back-to-back games for United after a run of 19 games without one. It was the first time he had done so at club level since April 2016 for Juventus. Five of Henrikh Mkhitaryan's last six United goals have come in the Europa League. Jose Mourinho has won all four of his European finals as a manager, winning the 2003 Uefa Cup and 2004 Champions League with Porto, as well as the 2010 Champions League with Inter Milan. Mourinho has maintained his 100% win record against Ajax, winning all seven matches against the Dutch side. Late substitute Wayne Rooney made his fourth appearance in a major European final for Manchester United (also the 2008, 2009 and 2011 Champions League finals), equalling the record held by Ryan Giggs. United did not lose a single game this season in which they scored first (W37 D8). Marcus Rashford became the youngest Englishman - aged 19 years and 205 days - to start a major European final since Gary Mills in May 1980 for Nottingham Forest, who was aged 18 years and 198 days when he played against Hamburg. Match ends, Ajax 0, Manchester United 2. Second Half ends, Ajax 0, Manchester United 2. Antonio Valencia (Manchester United) wins a free kick in the defensive half. Attempt missed. David Neres (Ajax) left footed shot from outside the box is close, but misses to the right. Assisted by Hakim Ziyech. Attempt saved. Hakim Ziyech (Ajax) left footed shot from outside the box is saved in the bottom right corner. Assisted by Davinson Sánchez. Substitution, Manchester United. Wayne Rooney replaces Juan Mata. Corner, Manchester United. Conceded by Joël Veltman. Attempt saved. Donny van de Beek (Ajax) left footed shot from the right side of the box is saved in the centre of the goal. Assisted by Bertrand Traoré. Dangerous play by Davy Klaassen (Ajax). Attempt missed. Davinson Sánchez (Ajax) right footed shot from outside the box is too high. Assisted by Frenkie de Jong. Substitution, Ajax. Frenkie de Jong replaces Jairo Riedewald. Attempt missed. Matthijs de Ligt (Ajax) left footed shot from outside the box is high and wide to the left. Assisted by Joël Veltman. Attempt blocked. Donny van de Beek (Ajax) right footed shot from outside the box is blocked. Corner, Ajax. Conceded by Matteo Darmian. Jairo Riedewald (Ajax) is shown the yellow card. Foul by Bertrand Traoré (Ajax). Daley Blind (Manchester United) wins a free kick in the defensive half. Hand ball by Henrikh Mkhitaryan (Manchester United). Bertrand Traoré (Ajax) wins a free kick in the attacking half. Foul by Daley Blind (Manchester United). Corner, Ajax. Conceded by Chris Smalling. Attempt missed. Hakim Ziyech (Ajax) left footed shot from outside the box is high and wide to the left. Assisted by David Neres. Attempt blocked. Bertrand Traoré (Ajax) left footed shot from the centre of the box is blocked. Assisted by Davy Klaassen.